Local laser excitation and temperature readout from the intensity ratio of Stokes to anti-Stokes Raman scattering signals are employed to study the thermal properties of a large graphene membrane. The concluded value of the heat conductivity coefficient \kappa ~ 600 W/m \cdot K is smaller than previously reported but still validates the conclusion that graphene is a very good thermal conductor. 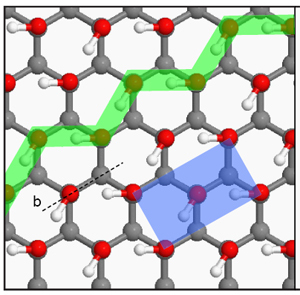 Using first-principles calculations, we show that the formation of carbohydrate directly from carbon and water is energetically favored when graphene membrane is subjected to aqueous environment with difference in chemical potential across the two sides. The resultant carbohydrate is two-dimensional, where the hydrogen atoms are exclusively attached on one side of graphene while the hydroxyl groups on the other side form a herringbone reconstruction that optimizes hydrogen bonding. We show that graphene undergos semi-metal-insulator transition upon hydration which is readily detectable from the significant shift in the vibration spectrum. The hydrate form of graphene suggests new applications for graphene in electronics, either deposited on a substrate or in solution. Energy transfer from photoexcited zero-dimensional systems to metallic systems plays a prominent role in modern day materials science. A situation of particular interest concerns the interaction between a photoexcited dipole and an atomically thin metal. 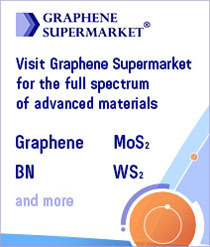 The recent discovery of graphene layers permits investigation of this phenomenon. 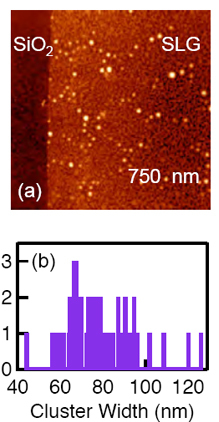 Here we report a study of fluorescence from individual CdSe/ZnS nanocrystals in contact with single- and few-layer graphene sheets. The rate of energy transfer is determined from the strong quenching of the nanocrystal fluorescence. For single-layer graphene, we find a rate of ~ 4ns-1, in agreement with a model based on the dipole approximation and a tight-binding description of graphene. This rate increases significantly with the number of graphene layers, before approaching the bulk limit. Our study quantifies energy transfer to and fluorescence quenching by graphene, critical properties for novel applications in photovoltaic devices and as a molecular ruler. We demonstrate that visible transparency of any two-dimensional system with a symmetric electronic spectrum is governed by the fine structure constant and suggest a simple formula that relates a quasi-particle spectrum to an optical transmission of such a system. 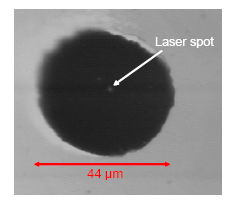 These results are applied to graphene flakes immobilized on a surface of oxidized silicon for which we measure ellipsometric spectra, extract optical constants of a graphene layer and reconstruct the electronic dispersion relation near K-point using optical transmission spectra. We also present spectroscopic ellipsometry analysis of graphene flakes placed on dielectric amorphous quartz substrates. The application of graphene in electronic devices requires large scale epitaxial growth. The presence of the substrate, however, usually reduces the charge carrier mobility considerably. We show that it is possible to decouple the partially sp3-hybridized first graphitic layer formed on the Si-terminated face of silicon carbide from the substrate by gold intercalation, leading to a completely sp2-hybridized graphene layer with improved electronic properties. We report a metal-insulator transition in disordered graphene with low coverages of hydrogen atoms. Hydrogen interacting with graphene creates short-range disorder and localizes states near the neutrality point. The energy range of localization grows with increasing of H concentration. Calculations show that the conductances through low-energy propagating channels decay exponentially with sample size and are well fitted by one-parameter scaling function, similar to a disorder-deriven metal-insulator transition in 2-dimensional disordered systems. 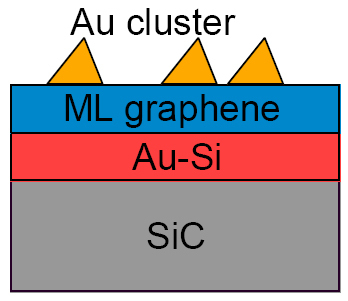 We investigate the effect of gold (Au) atoms in the form of both point-like charged impurities and clusters on the transport properties of graphene. Cryogenic deposition (18 K) of Au decreases the mobility and shifts the Dirac point in a manner that is consistent with scattering from point-like charged impurities. Increasing the temperature to room temperature promotes the formation of clusters, which is verified with atomic force microscopy. We find that for a fixed amount of Au impurities, the formation of clusters enhances the mobility and causes the Dirac point to shift back towards zero.